Lawyers are famous for their use of complicated and hard to understand writing. Sometimes when ordinary people (read: non-lawyers) receive lawyers’ emails, documents or contracts they pass over the document without developing a deep comprehension of the material. They shrug that off because they expect legalese to be complex and think that it all must mean something. It sometimes doesn’t. The other day, a member of our marketing team was working on our most recent newsletter on “Mortgage Contingencies.” After reading the draft of the article 6-7 times over he still lacked a basic understanding of the topic. In an attempt to clarify the meaning of the article, he turned to Google, but his disappointment grew even deeper when none of the top web-results coherently explained the topic either. In fact, the other sources were even more confusing than the draft article and used the language of legal documents. To better help our clients understand what is going on in litigation, we have a duty as lawyers to improve legal writing skills, fix our bad legal writing, and learn effective legal writing. In this article we seek to outline the reasons for bad legal writing and provide tips for legal writing to resolve the problem. We understand that most lawyers, law students, and judges are busy people and may not have the time to read through the whole article. 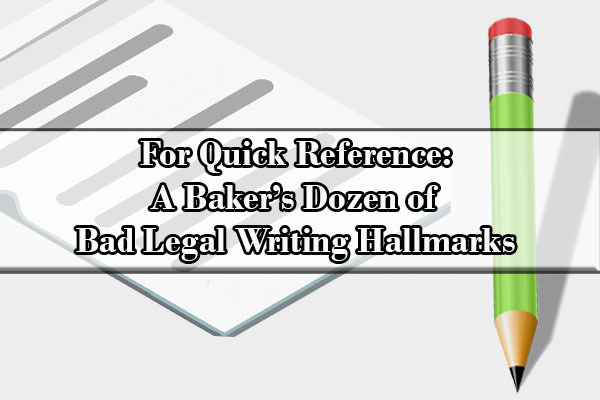 For simplicity, we’re providing you with our “baker’s dozen” of bad legal writing hallmarks so that you know what to look for ahead of time to spot your most obvious drafting problems. Your sentences have more words than you would be willing to serve if each word was worth a day in federal prison: Short and concise legal writing is always preferable. Your longest sentences should hover around 20 words. If your document reads like the Gettysburg Address, it is well-written in this regard. Your paragraphs form squares (or even worse, vertical rectangles): Pacing and white space is more important than you realize. Create new paragraphs often to avoid losing your reader in a smog of black text. You overuse passive voice: Using active voice sentences will help cut word count and add a punch to your sentences. A powerful verb exists for the point you want to make. Use a thesaurus to find a verb if you need to. Also, it helps to try and always place the active verb close to the beginning of the sentence. You do not murder your adverbs: Stephen King famously said: “the road to hell is paved with adverbs.” He meant that while adverbs are intended to provide clarification, they needlessly slow down the narrative. For example, the word “suddenly” takes any suspense out of a surprise because you know a surprise is coming. You also use parentheticals to harbor non-essential information: Both adverbs and parentheticals should be avoided wherever possible. Parentheticals too often contain useless tangents or anecdotal information. If the information in your parenthetical does not deserve its own sentence, it is not important. You avoid the vernacular for some reason: Vernacular speech is simply the progress of language development over time. In a sense, vernacular speech is the cutting edge of language arts. Legalese has no real reason to remain stuffy and sounds arrogant. You write numbers two (2) times every time you use them: It is debatable whether there is still a reason to use parenthetical numbers. Assuming they serve a genuine purpose in contractual writing, that is still no reason to use them in letters and emails. You define everything: The most useful definitions are those that define words you use that may take on a trade usage or a different meaning than the ordinary dictionary definition. If you have used a word in its ordinary dictionary sense, it does not need a definition. You expect laypersons to understand both legalese and Latin: Legalese is one thing, but if you took a poll of people sitting around every neighborhood bar, none of them would be able to tell you the meaning of nunc pro tunc without Googling it. You try to plan for every contingency: Especially when writing contracts, it’s important to think about what litigation could arise, but you should not need to specify everything. For example: “party A may sue party B for damages in the event of a breach” does not need to become “if party A has complied with the contract, party A may sue party B for damages.” The addition is a mere statement of obvious contract law. Very few lawyers put any real consideration into their legal writing. We are not referring to considerations of verbiage or comma placement; those are the types of minutia that lawyers will get hung up on regularly. We want you to think about the bigger picture. When you write a legal document, you should first ask yourself several big picture questions that can immediately affect the quality of your legal writing before even getting into small details. Who is my audience and what does that mean for the writing? The first rule of any form of writing is to know your audience. Popular young adult novels such as Harry Potter and the Hunger Games would have never made it past the publishers if they read like high literature such as Les Miserables or Ulysses. The same is true of legal writing. Not everything you write is going to be read by judges and legal academics. As litigators, most of our writing is read by other lawyers and ordinary people. The content, tone, vocabulary, and vernacular grammar should all adjust accordingly to convey the necessary message. Will my legal (or other) education work against me while I am writing? Often, the answer is yes. Again, if you are writing to a judge, you probably should utilize the extent of your legal expertise (although, be careful: many judges prefer concise and accurate languages rather than flowing argument, so run wild at your own risk). When you are writing to anyone else, you need to consider the fact that the majority of grown Americans have a middle-school vocabulary and occasionally have difficulty understanding sentences with more than two clauses. It doesn’t help that law students spend their days reading legal writing that is often verbose, stilted, and chock full of legalese. We were shocked when our marketing team came across article-writing guidelines that indicated that sentences in our client advertising should contain no more than twenty words per sentence. Hint: Use online tools, like Hemingway and aim for 9th grade in your writing. What is my goal in writing? Tone is a critical component in legal writing and should shift based on the purpose of the writing. Each of those tones has different uses and should be used accordingly. For example, a demand letter may have an angry tone. It does not need paragraphs of informative fluff or legalese. Informative legal writing such as court briefs, similarly, should include extensive analysis of the law but should not exude considerable emotion. Relying too heavily on pathos in court briefs tends to imply that you believe your logical argument is not strong enough to win. Do I want to receive an intelligent and informed response from a layperson? Our legal writing is most confusing to our audience when we address laypersons with no legal experience. 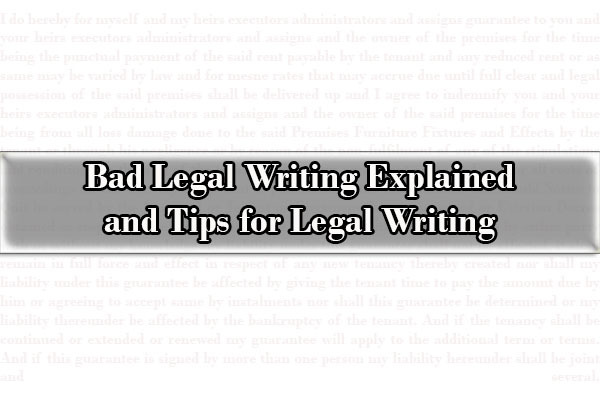 If you are expecting a piece of legal writing to be read by a layperson, you should adjust your writing accordingly if you expect to receive a response or information back. Emails and letters full of legalese are more often left unanswered or answered with incorrect information based on a misunderstanding. If your goal is to avoid receiving a response, feel free to be confusing, but that is rarely the case if you are communicating with a client, potential witness, or other similar person. Does using legalese make me sound smarter to my peers or simply more arrogant? Lawyers often feel the need to write like a lawyers, so that they will earn respect. This is different from intentionally making the document difficult to read to protect a trade guild’s insularity. In his early days, one of our partner’s supervising attorneys rejected his draft, not because of its substance, but because it supposedly sounded “like two people talking in an elevator.” This comment was clearly not meant as a compliment, but it should have been. More people have conversations in bars and on street corners than in law school classrooms. If you disliked the “gunners” or know-it-alls of law school, imagine how ordinary people view regular attorneys. How much legalese do I really need to cover every possible contingency? This means lawyers end up having to use a lot of words that might seem unnecessary, but really are required to avoid problems later on. Sometimes attorneys have to use certain words and phrases because they are required to meet the basic requirements for a case. This can lead to some pretty awkward language in pleadings and briefs. Is it time to revise the template? Pre-drafted or “canned” templates are the bane of legal existence, but like a bag of frozen peas, they have an understandable and important purpose. For efficiency, lawyers rely heavily on prior documents and industry templates as starting points. It would take quite a bit of time to redraft a whole contract from scratch, and neither law firm partners nor their clients want to pay for it. That said, however, doing regular spring cleaning of your firm’s templates is a fantastic idea. One of the reasons so much legalize ends up in documents, like contracts, is because it contains the respective contributions of generations of attorneys. Attorneys tend to glob on additional language they believe is necessary, resulting in confusing run-on sentences and outdated terminology. 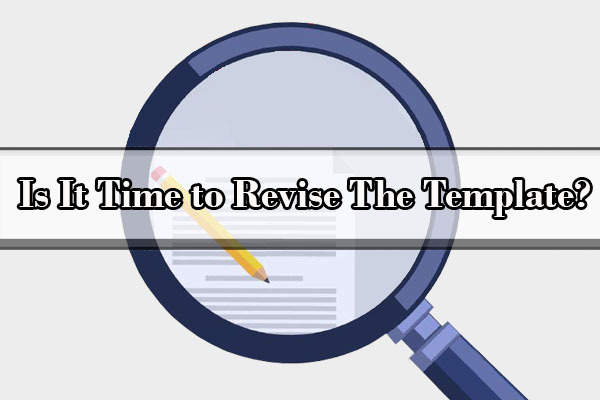 Rather than simply add to templates, law firms should routinely review templates for the purpose of deleting anything extraneous or dated (“heretofore” went out of style last century). This is particularly important when it comes to contract clauses or motion templates that may have relied on older overruled precedent. Will this document be negotiated later, and if so, how does that affect drafting? Because most contracts are negotiated, finished products are often weighed down by the contributions of multiple authors with different agendas and styles. Lack of coordination and midnight amendments all contribute to the hard-to-read and legalistic nature of contract documents. When attorneys play ping-pong with a contract, the document simply gets worse and worse each time it goes back and forth as though the paddles used by the attorneys are coated in grease and wet paint. Before you instruct the client to sign the finished product, it is often advisable to ask the client to read the agreement and see if the client can discern the meaning and intent of the agreement from the text. If not, then it needs to go back to the drawing board. Unfortunately, this is something all of us need to work on as a profession. Our lawyers are not perfect and we correct each other’s writing on a daily basis. The most important thing that you can do to improve your legal writing is to take time with it and find help editing if you need it. Legal writing requires correct grammar and accurate substance. But effective legal writing must also communicate a clear message. Before putting your fingers to keyboard, plan ahead and identify your audience and purpose. Outlining is a lost art that should make a comeback, especially in the legal profession where all writing is inherently complex. Once you have a draft, edit it at least once. If you are in a hurry, still give yourself enough time to read through it carefully for simple spelling and grammar edits. If you happen to have time before the deadline but are stuck doing other tasks, ask other attorneys or even your paralegals to read through your writing to see if they find any errors that you missed. 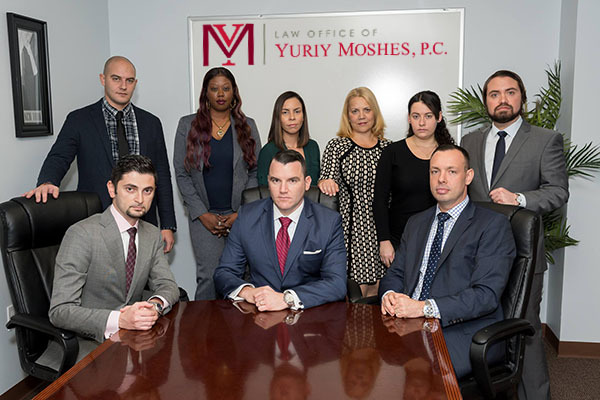 We at the Law Office of Yuriy Moshes hope that this article will help you to write effectively, attract more clients, and improve their understanding of what we do. As we have stated, we are not experts in legal writing either. If you have any additional tips or tricks to help improve your legal writing, we would love to hear any input that you may have. What are your favorite editing tips? Are there other legalese terms or phrases that you wish would simply die out?